Since 1987, Porch Outfitters has been the trusted source for an enclosed patio and other outdoor living products in Hilton Head, South Carolina. We offer only top-of-the-line products and service that is tailored to our customer’s needs, ensuring they get the best possible value for their investments. And, we are committed to providing first-rate installations, which we achieve by using our own team of trained and experienced technicians – never subcontractors – and adhering to the strict building standards set forth by the Aluminum Association of Florida. When you choose Porch Outfitters to build an enclosed patio structure, you’ll have plenty of options to choose from. For example, we offer sunrooms from TEMO – the industry leader. These beautiful additions bring the outdoors in, allowing you to enjoy the beauty of your backyard along with the comforts of your home. Thanks to their thermal wall and roofing systems, your sunroom will remain comfortable throughout every season. 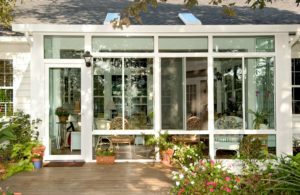 And, because they’re built with extruded aluminum with an exceptionally durable TEMKOR surfacing, you can expect your sunroom to last for as long as you own your home. In fact, it will come with a lifetime warranty. Additionally, Porch Outfitters can build custom screen rooms in any size or configuration you desire. These enclosed patio structures are perfect for covering a pool or simply creating a space to relax and enjoy the beautiful weather without having to deal with pesky insects. Begin your enclosed patio project today by contacting Porch Outfitters. We will be happy to tell you more about our services and discuss the easy financing options we offer to qualified homeowners.